Sam Phillips In Concert Of all of Sam Phillips' roles as a musician — first as a contemporary Christian singer, later as an ornate pop artist — her latest incarnation is the most alluring. Her jangly, mostly acoustic songs rattle and shake with graceful, noirish tales of broken lives. Phillips is currently on tour in support of her latest CD, Don't Do Anything. She showcased the album in a full concert, recorded live at the Rams Head in Annapolis, Md. Of all of Sam Phillips' roles as a musician — first as a contemporary Christian singer, later as an ornate pop artist — her latest incarnation is the most alluring. Her jangly, mostly acoustic songs rattle and shake with graceful, noirish tales of broken lives. Phillips is currently on tour in support of her latest CD, Don't Do Anything. She showcased the album in a full concert, recorded live at the Rams Head in Annapolis, Md. 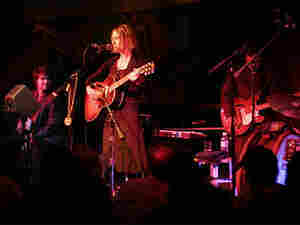 When Phillips decided to self-produce her latest CD, some fans and critics worried that it would lack the rich textures and sonic color of her previous albums, produced by ex-husband and longtime collaborator T-Bone Burnett. But Don't Do Anything proved to be every bit as captivating and elegant as Phillips' past efforts, particularly for her continued emphasis on expressive melodies and precise songcraft. Phillips restrains her instrumentation — her songs are beautifully spare — without holding back any of the feeling that fuels them. Phillips has always been a searcher, and Don't Do Anything is steeped with the longing and hopeful heartache that has characterized much of her work. "I was born in East Hollywood," she says. "The religious and experimental/alternative lifestyles have always thrived here, because so many people come to Hollywood with dreams that get broken (or come true) and need to be replaced. I'd rather make art than make my dreams come true. I'd rather be interested and inspired." Phillips, who recorded Christian music under her given name of Leslie Phillips, still cites religion as one of her sources of inspiration. She also draws from "1950s and '60s-era advertisements, electricity" and "time." "There are some songs you can't write until you've lived long enough," she says. "At this point, I am much more interested in the things that are bigger than TV, smaller than mass culture."